Riding Dapper for a Cause! On Sunday September 30th, over 120,000 people over 650 cities worldwide put on their finest clothes and hopped on their vintage and classic motorcycles for the Distinguished Gentlemen�s Ride. The event was established to raise funds and awareness for men�s health, specifically prostate cancer and men�s mental health. This event is important to not only fundraise for these important causes but connect and encourage open discussion about serious issues affecting men today. The unique event saw participants arrive in tailored suits, silk waistcoats, crisp shirts and polished brogues for what promised to be a decidedly dapper affair. 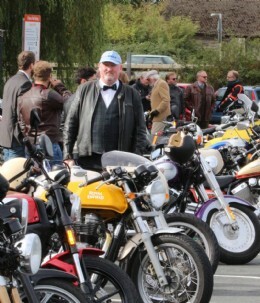 �On Sunday the 30th of September, I donned my finest attire with my fellow men and women across the globe to join the fight with The Distinguished Gentleman�s Ride in Oxford to raise awareness for prostate cancer and men�s mental health. We rode classic bikes. I pressed my tweed and polished my boots, in the hope that I would receive a few donations for this meaningful cause and help me reach my goal. Prostate cancer affects more men than any other cancer, taking the lives of close to 307,000 men each year. A number surpassed by 500,000 men dying from suicide. That�s 807,000 men every year. This is a number that must change. Want to take part in the next Distinguished Gentlemen�s Ride or would like to donate?